The app will likely launch with the next big Windows 10 update this fall. Windows 10’s virtual reality chops will be bolstered by a nifty-looking new Microsoft app launches this fall, presumably alongside the next big Windows 10 update. The straightforward-named “View Mixed Reality” app will allow users to view augmented reality images and 3D rendered digital objects through their device screen, placing them alongside real-world objects. 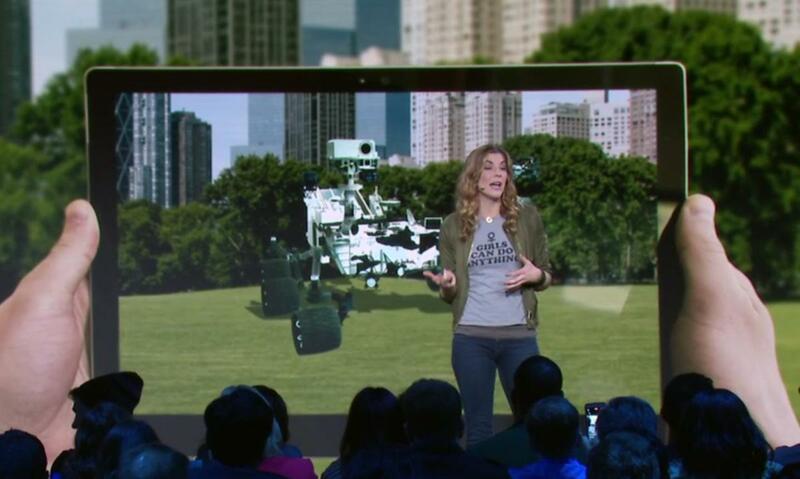 In an onstage demo at Microsoft’s educational event today, View Mixed Reality was used to display the Mars Curiosity Rover next to a speaker, to show how large it is in real life. Paired with the Paint 3D app introduced in the Windows 10 Creators Update, or 3D educational tools already starting to trickle into the market, this could be a handy feature in the classroom. Microsoft only mentioned that View Mixed Reality will be available on school PCs running Windows 10 S, but this event was dedicated to Microsoft in the classroom. I’d be shocked if the app didn’t wind up in traditional versions of Windows 10 as well. It works with any device equipped with an RGB camera, even if it’s just a USB webcam. Support for 3D objects in Office was announced for the Windows 10 Creators Update, but failed to make the final cut. At the event, Microsoft revealed that those abilities will also launch this fall. Windows 10 sure is going all-in on mixed reality.